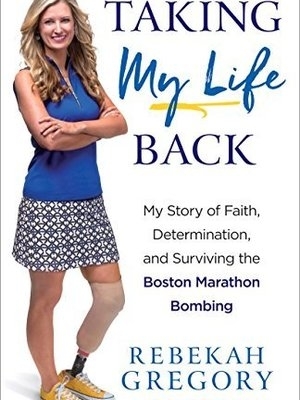 Rebekah Gregory is a wife and mother whose life was forever changed due to the bombings at the Boston Marathon on April 15, 2013. This act of terrorism may have claimed her leg, but it could not claim her spirit. Since then, Rebekah has used her platform in a huge way by traveling all over the country speaking out against evil, and encouraging people to turn their obstacles into opportunities. What can we say about Rebekah? When she took the stage she warmed our hearts, brought tears to our eyes and lifted our spirits. She is a gifted public speaker and her energy and positive aura left all of us thankful for the encounter. Hearing her speak and being in her presence left us feeling hopeful and uplifted. To put it simply, we adored her. Rebekah was fantastic. She delivers a powerful message and she speaks from the heart. She really connected with our audience. She was great to work with! Thank you very much for sharing your story and your experiences with our attendees. Your indomitable spirit and positive outlook are truly an inspiration, and I know the injuries suffered in Boston can never dim your light that shines so brightly. We hired Rebekah to be the keynote speaker and found her message to incredibly inspiring and thought-provoking to our diverse audience to the point they lined up afterwards to meet her and let her know how much they appreciated her telling her story. I wanted to let you know that Rebekah was an absolute joy to work with. She is such a positive and inspiring woman, and she is an EXCELLENT speaker. We would definitely recommend her. She truly was one of the most down-to-earth, uplifting, and awesome speakers we've ever had. A true professional. Thank you for helping to make arrangements to have her speak on our campus. The process of working with the speaker's agency was so easy and streamlined. The event was a huge success! "This is the day I take my life back..."